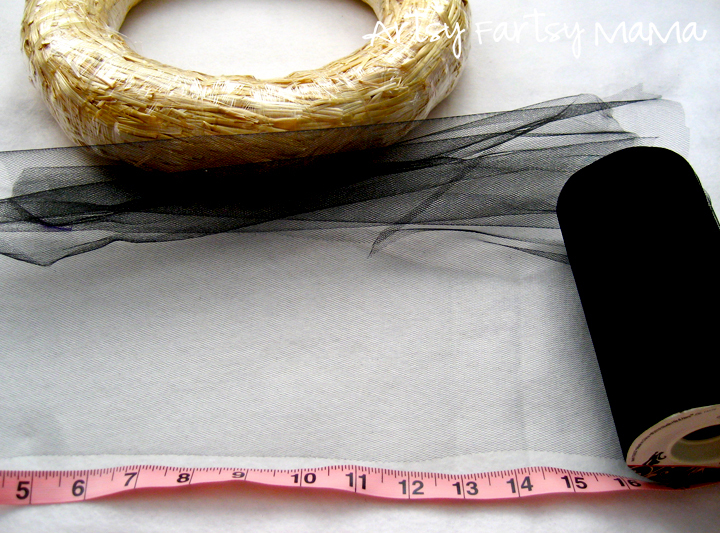 Step 1: Cut strips of tulle about 16-17 inches long. Lots of strips. Lots. Keep cutting strips, even if you think you have enough. Step 2: Start tying! Wrap the strip around the wreath and tie in a double knot, keeping the ends even. I used two strips at a time because I could see the wreath through the tulle. The one on the left is doubled, the one on the right is single. Step 3: Tie strips close together, covering the wreath underneath. Tie in extra strips if necessary to cover any "holes". 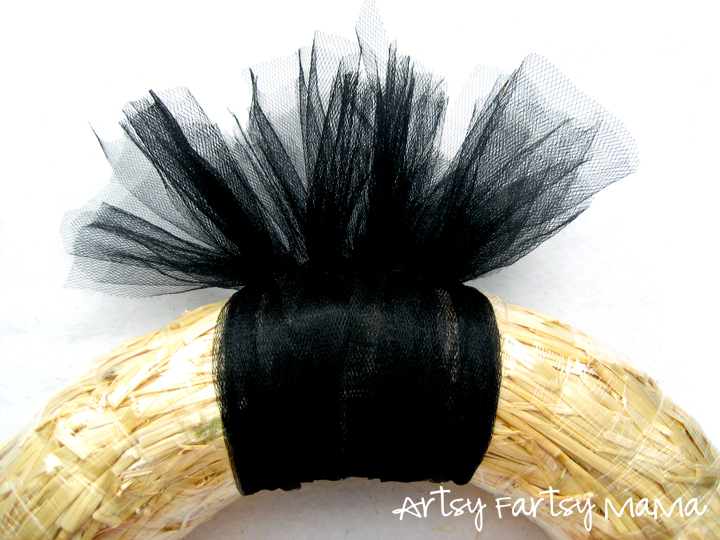 Step 4: Tie tulle strips on until you can no longer see the wreath form. 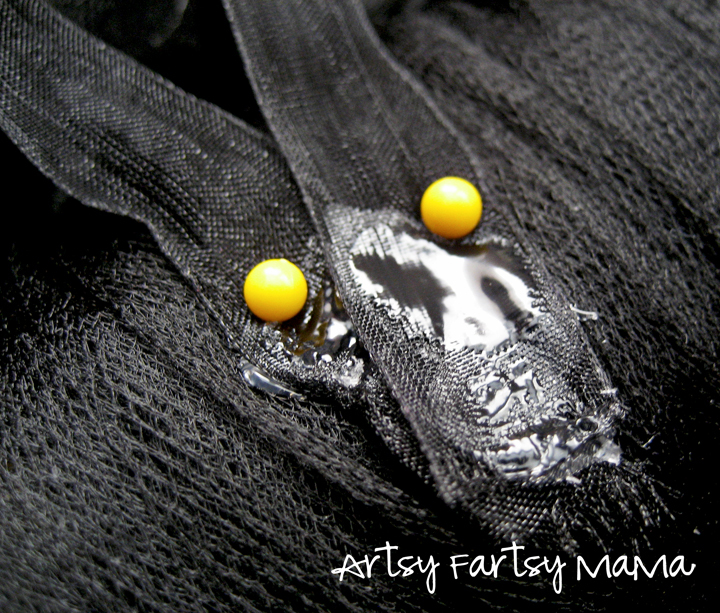 Step 5: Next, carefully hot glue the boa along the tulle knots. Easy enough, right? At this point the wreath can be finished, but I wanted to add a little more. When in doubt, add some glitter! 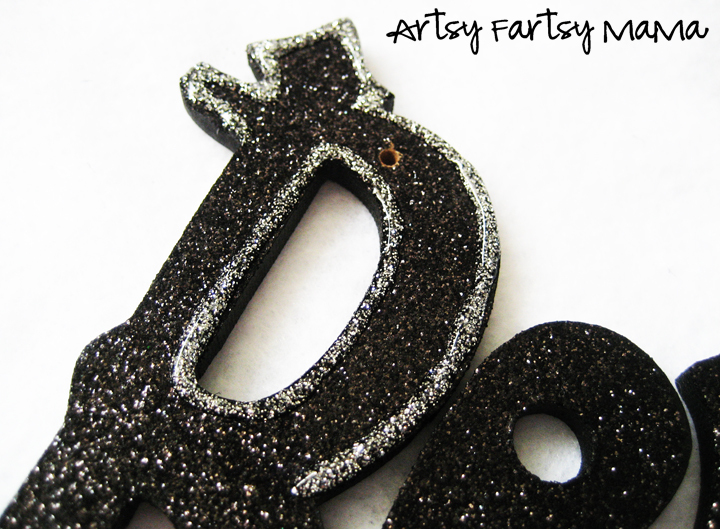 I added a thin line of silver glitter glue around the edges of the sign. Brightened it up just enough, but still kept the dark sparkly-ness that's perfect for Halloween! I then attached it to the wreath with some hot glue and fluffed up the feathers around it. 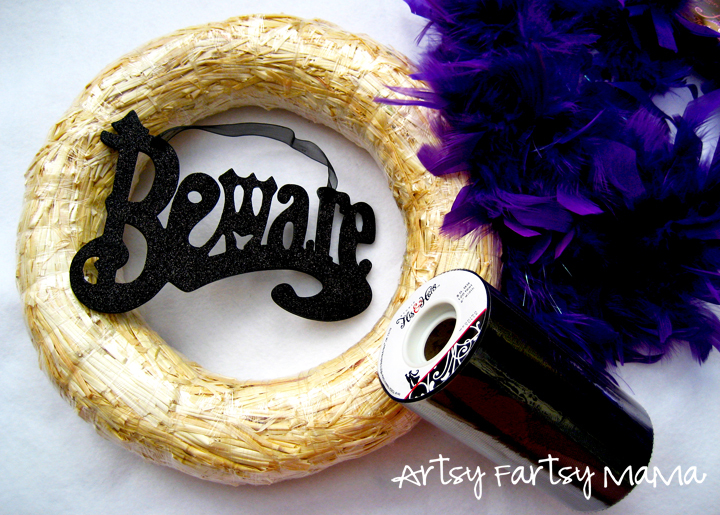 For the hanger, I removed the ribbon off the Beware sign, hot glued it to the back of the wreath and reinforced it with some pins. Perfect!! I just love this wreath!! So fun for Halloween! Hello, I am your newest follower via GFC from the Friday Friend Connect hop. Stoping by from Couponing From Florida to Michigan. Feathers- LUV, no DoUBle LUV! Thanks for sharing your wreath. I had just picked up a few wreath forms today with the thought of feathers. I am so in love with this wreath, thanks for sharing! Love this!!! 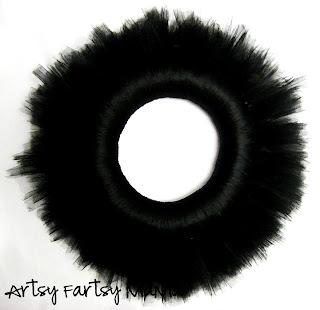 I love the tulle - but especially love the feathers!! 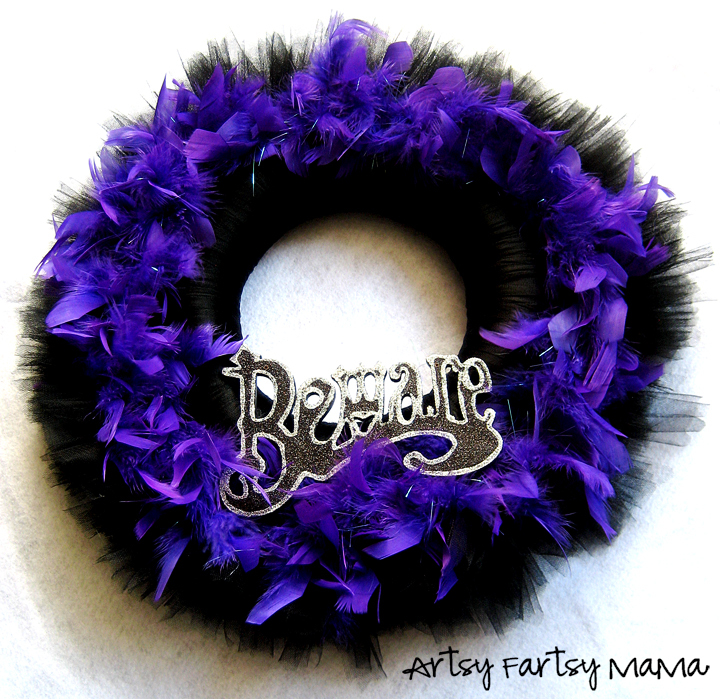 This is my favorite Halloween wreath that I have seen on blogland. I am soooo pinning this! LOVE LOVE LOVE! IT! Sorry to shout but it is gorgeous! What an awesome deal - great job! The wreath is gorgeous! 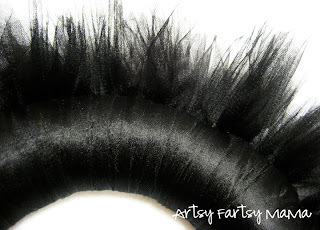 I love the contrast in textures between the tulle and feathers. And the colors are so fun - great Halloween wreath! I'd love if you linked up to our Fall Wreath Craft Party this month! I love the added purple feathers/boa. So fun! Thanks so much for sharing and linking up! OMG Lindsay! I totally love this one! I'm gonna have to do one! Thanks for linking up today! Love your wreath, Lindsay...unique and beautiful. Also versatile. You could do this for so many occasions, using the base wreath and interchanging the face materials. Awesome. I am following you, Lindsay, and look forward to return visits. I hope you will join me as well. Hugs, Gayle. Fab!! I love it! Please come and link this up on my Blog http://sewstylishboutique.blogspot.com/ for Crafty Lassie Tuseday open today. Love your wreath! It looks like something you'd get in a specialty shop! Thanks for sharing! LOVE it! ANd I love the beware sign! I wish I had like 6 doors to my house so I could do all these fun wreaths! Love your wreath. Saw it on Sumo's link party. The wreath is gorgeous! The contrast in textures between the tulle and feathers are marvelous. 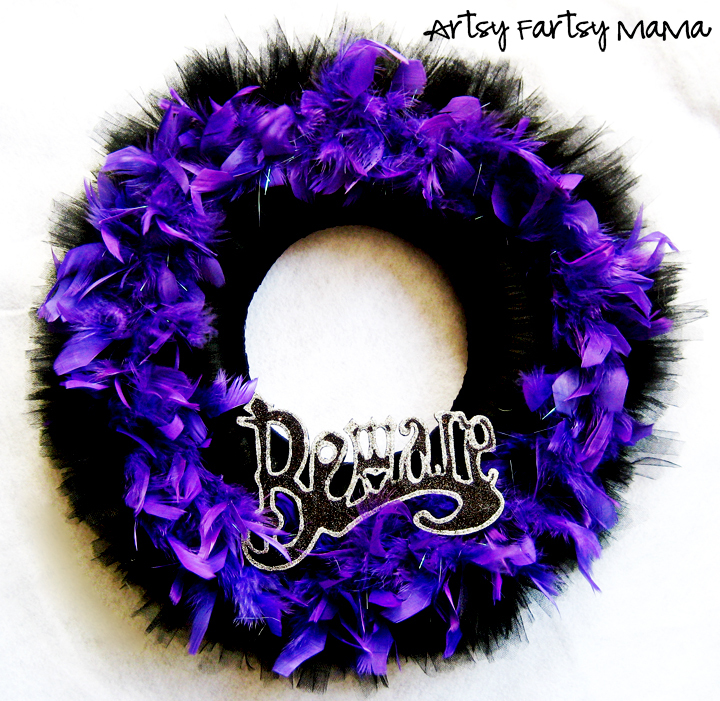 And the colors are so fun to ordering, great Halloween wreath! I love it! 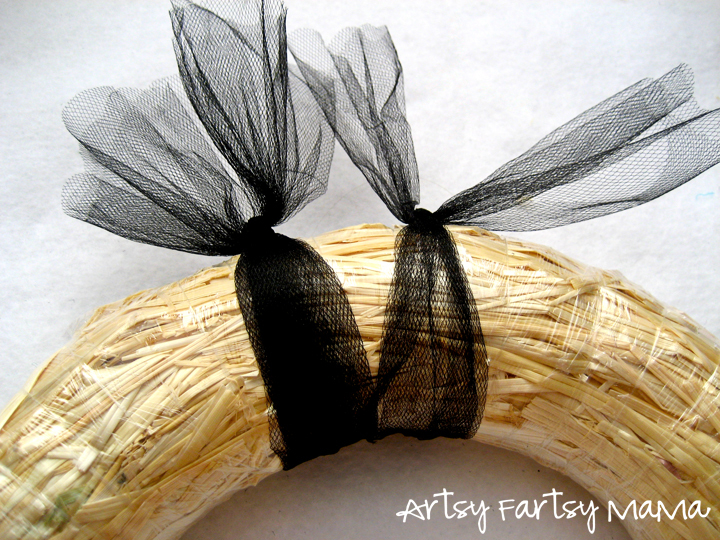 I never thought of using a wrapped straw wreath before! The styrofoam ones can get expensive! I love it! 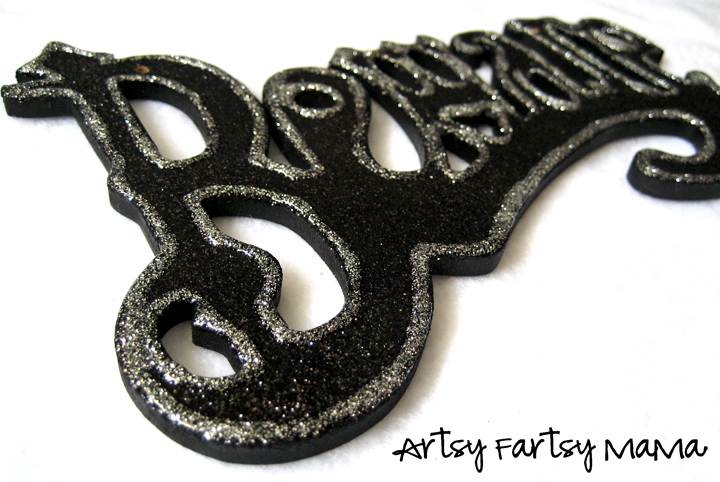 Thanks for sharing at scrappy saturdays, this is being featured this coming weekend! VERY cool! Love the boa, what a great idea! Great idea to outline the letters. They look great with the definition! Thanks for linking up with DIY under $5! new follower and sooo glad I am...what a cute idea!! I love it!! Oh that silly cashier!! I love this! You did such a great job and kudos on your savings. Too bad about that cashier. It's not like when you use a coupon it comes out of their paycheck ;)And who doesn't like to save money? 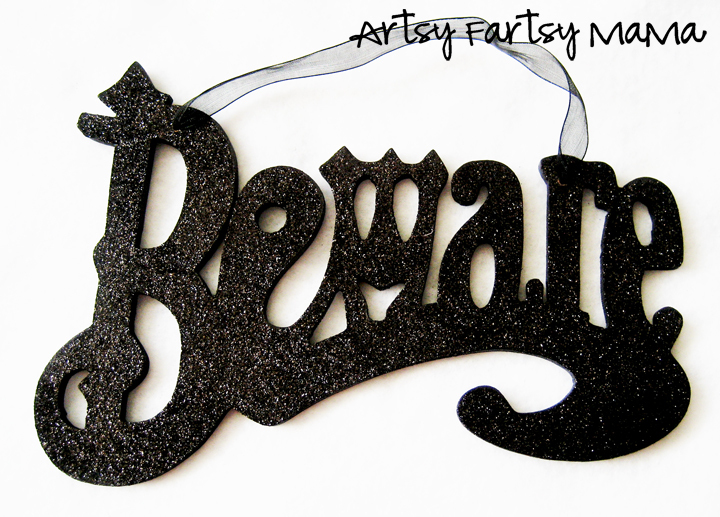 I'll be featuring this on tomorrow's Thrifty Thursday Link Party! Love the wreath. I really like purple and black for Halloween. Going shopping Thursday to buy the supplies to make this.